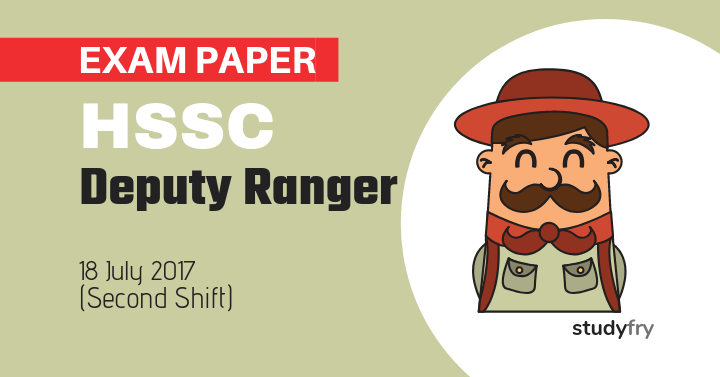 HSSC Deputy Ranger Solved Exam Paper – 2017 (Second Shift): HSSC Deputy Ranger at Forest Department, Haryana exam held on 18 July 2017 in three shifts, this is a second shift exam paper. This HSSC Deputy Ranger exam paper available in Hindi language. 3. प्रदूषित जल में से आयरन और मैंगनीज निकालने में, निम्नलिखित में से कौन-सा तरीका प्रभावी नहीं है? 6. Identify the meaning of the idiom-Cry over spilt milk’. A. Worrying about losses that may occur. B. Crying that somebody has hurt with harsh words. C. Pleading and asking excuse for a wrong action. D. Complaining about a loss from the past. 7. The sentence given below contains one or more mistakes, Identifiy the correct sentence. A. I brought a costly watch for my watch. B. I bought a costly watch for my sister. C. I had brought a costly watch for my sister. D. I had got a costly watch for sister. 9. _______ is the synonym of ‘Assignment’. ABCDE : ZYXWV : GHIJK : ________ ?